I made these cookies for my grandkids to sell at our garage sale this summer, among many other kinds. They were gone before anything else and I wished I had made more. I made them quite large, which besides being delicious, appealed to many and disappeared pretty fast. Preheat oven to 375 degrees. In large bowl, sift together the first 5 ingredients. Cream butter and sugar together until light and fluffy in mixer. Add eggs, one at a time, until each is incorporated. Add corn syrup and vanilla and mix well. Set mixer on medium speed and add dry ingredients in three batches. Mix just until they come together. Mix sugar and cinnamon together in bowl. Portion dough out in 2-inch balls and roll each in the cinnamon-sugar mixture. Gently flatten out and place 3 inches apart on a baking sheet lined with parchment paper or silpat. Bake for 8-10 minutes, until light golden brown around the edges. Cool on the pan for 2 minutes, and then transfer to wire rack and cool completely. 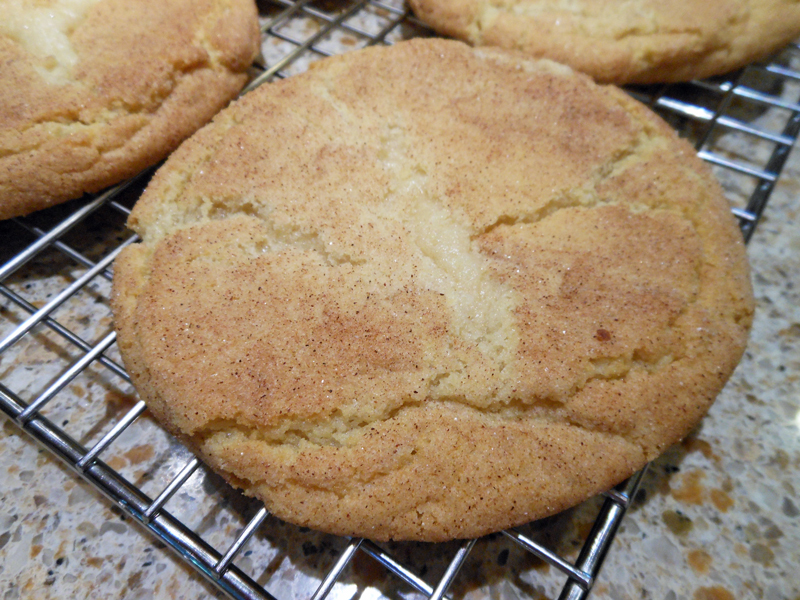 Note: If you do not want to make gigantic cookies like these, make them normal size and do not bake them as long.